NOTICE: This blog post refers to historical terminology which some people may find offensive. One of the most interesting documents we have found at Warwickshire County Record Office is a ‘Patients Book’ (CR2098/14). It contains ‘records of interviews of patients by members of the Board of Control, and other official visitors’. It covers the years 1914-1960, although we can only look at the pages that are over 100 years old (the reasons why are explained here). The entries in the pages that we could view are generally about officials coming to interview the patients and judging whether they should stay at Middlefield. This is following the main law that was in place at the time, the 1913 ‘Mental Deficiency Act’. 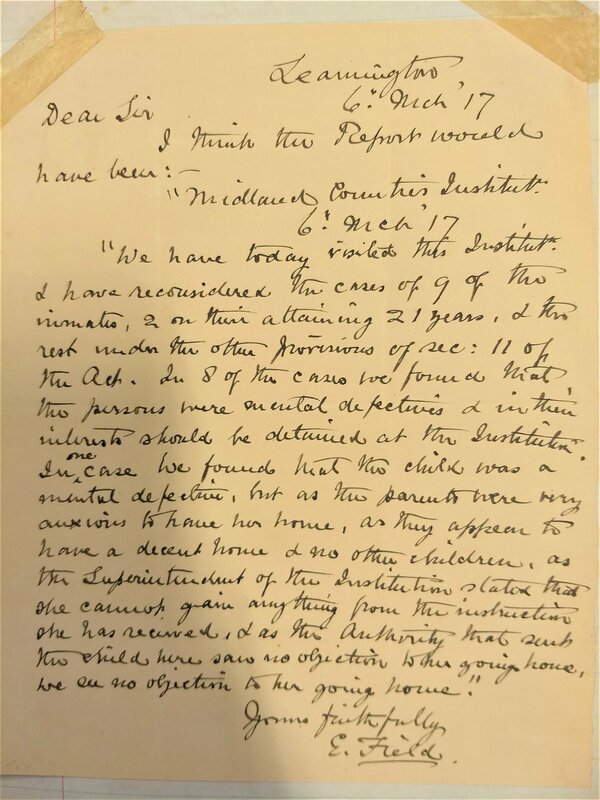 Many of the patients at Middlefield at this time (1914-1918) are young, with the oldest only in their 20s. In almost all of the cases, the officials decide that the patients should stay at Middlefield. However, even in this short 4 year period, there are several cases of the parents of the patients appealing to have their children returned home. Sadly, even then, they often were not successful. We will look at this in more detail in a later post. The parents of Edward Hickman were successful. The entries in the ‘Patients Book’ referring to his case are below, and have been typed out in full to make them easier to read. Edward Hickman is the boy mentioned in my report whose parents are asking for his discharge. Edward was finally discharged to go back home on the 16th June 1918. He had been at Middlefield for 8 years, and was then 20. He was discharged after at least a year and a half of his parents’ asking for his return. The last entry shows the many levels of bureaucracy that parents had to go through to try and get their children home. It is also an early form of advocacy, long before the establishment of the first citizen advocacy organisation in the UK, in 1979. Many thanks to the continued work of Samantha and the Warwickshire County Record Office for enabling us to share this information.